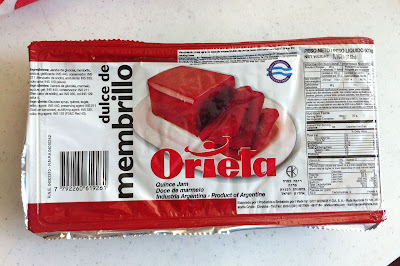 Another amazing sweet that my Argentinian in-laws introduced me to was Dulce de Membrillo. Here in the states, it translates as Quince Jam. Quince a a fruit that kind of looks like a pear, but is very bitter if eaten raw. The Argentinians boil it down and makes jam or jelly out of it. Usually the jam is in a block form and easy to slice. The easiest way to eat it and my favorite is to take a slice of quince jam and place on top of a slice of cheese (either a soft cheese like brie or a hard, sharp cheese) and lay both on top of a salty cracker. 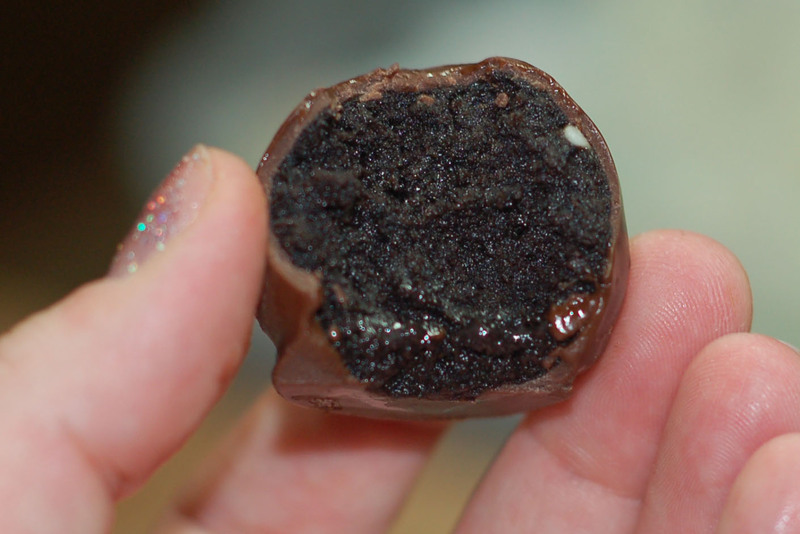 Oh my, a taste bud's delight! 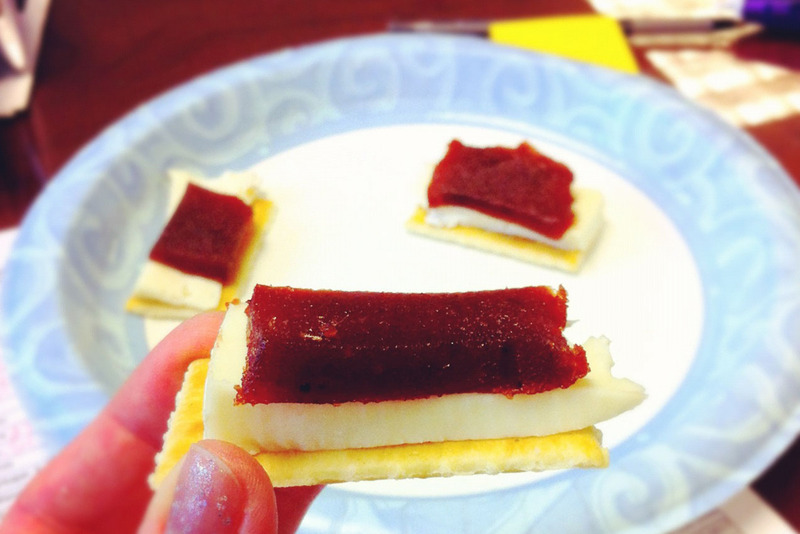 The cheese and the salty cracker balance out the sweetness of the quince jam in the perfect way. Quince jam can be found in your local Spanish market. 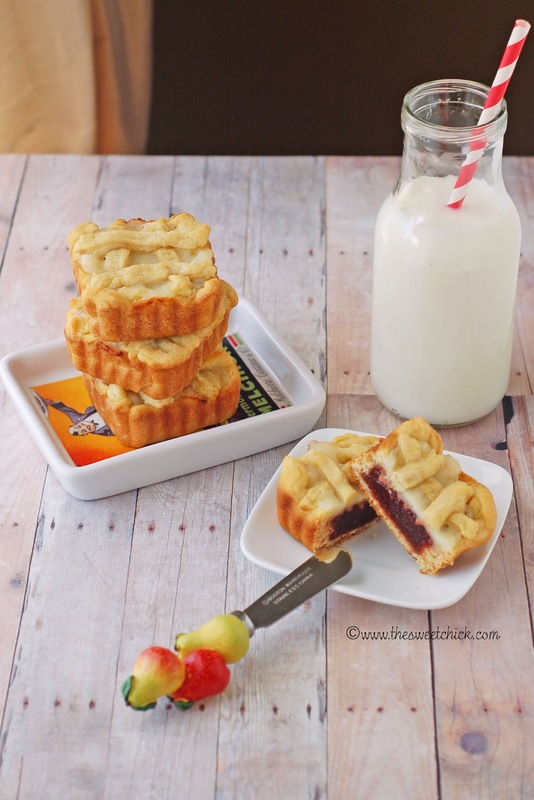 If you can't find it, you can also substitute guava paste. Goya makes guava paste and it is sold in supermarkets. You will find it in the Spanish aisle with all the Goya products. It is sweet like membrillo and the same consistency. It also tastes great with cheese. Ok, just for haha's I just checked on Amazon to see if they sold dulce de membrillo and wouldn't ya know it, they do. Those guys sell everything. So there you go, if you don't have a Spanish market near you, just check out Amazon.com. They also sell dulce de batata, which is a sweet potato jam. My husband likes it, but I am not a big fan. 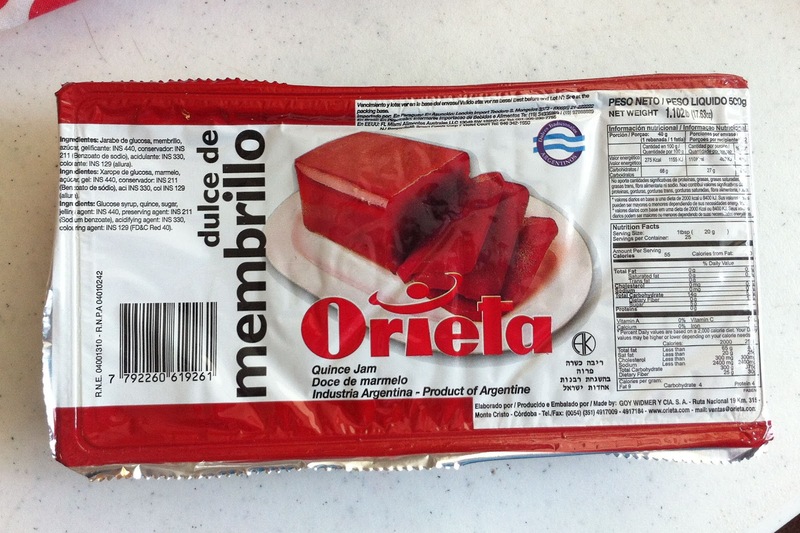 I like membrillo or guava better. I think because they are sweeter. 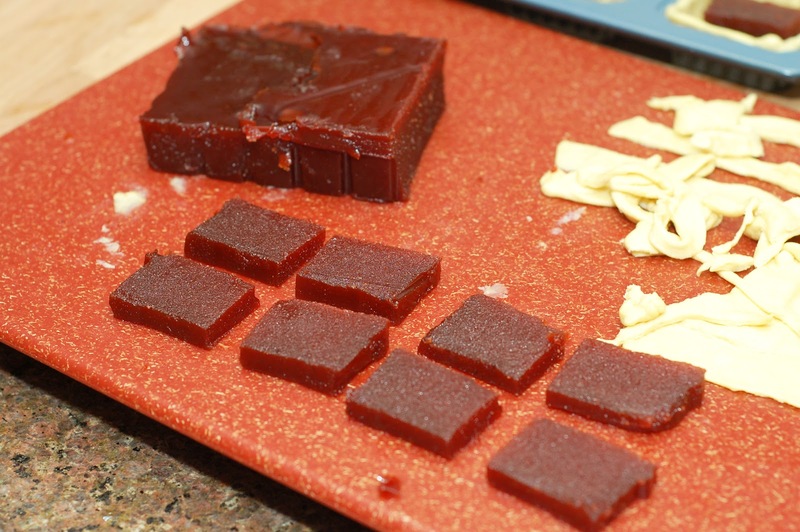 I am always looking to try different things and wanted to come up with something different with the membrillo. And I wanted to try out my cute new pan that I bought at TJ Maxx. 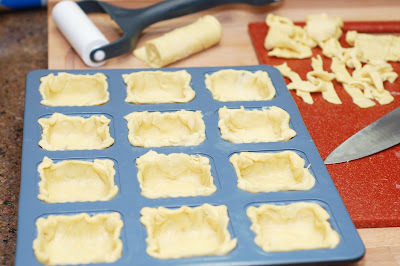 I thought, why not try mini tartes. 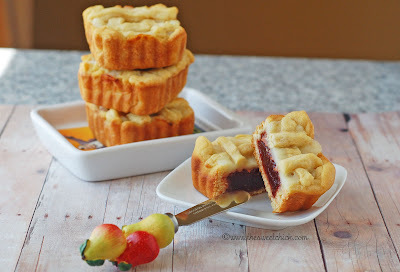 I kept the membrillo/cheese combo, but swapped out the cracker for crescent roll dough. Of course, I could have made my life easy and just rolled up the two ingredients into the crescent rolls, but that darn pan was just crying to be used. How could I say no? Doesn't your bakeware ever call out to you? I just unrolled the crescent dough and without separating the triangles, I rolled it out just a tiny bit thinner and cut it into squares to fit in my pan. Then I cut the membrillo to fit in the tartes. I put a nice thick slice at the bottom. I layered the brie on top. Don't forget to cut off the rind. Then I rolled out the left over dough and cut small strip to create a criss cross pattern over the cheese. I think they came out pretty good for my first try. I did try one while it was piping hot. Oh the cheese was so gooey and the membrillo so sweet. Mmmmmm! 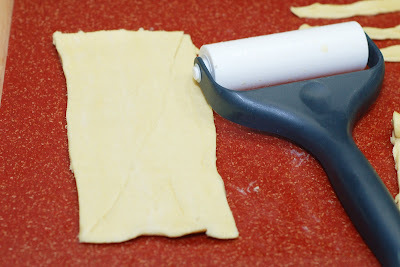 Unroll the crescent dough and lay out flat without separating the triangles. Using a rolling pin, roll out the dough into rectangles and then cut into 12 squares to fit in the muffin tin. Carefully line each of the muffin cavities with a crescent square and press into place. 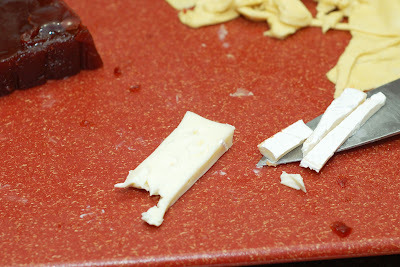 Cut a slice of membrillo and a slice of Brie to fit the squares, placing the membrillo on the bottom and the Brie on top. With the left over crescent dough cut thin strips to layer over the brie in a criss cross pattern. Four strips to each square. Bake at 375 degrees F for 11-13 minutes or until golden brown. Let the tartelettes cool off a few minutes before removing from muffin tin. Then eat and enjoy! 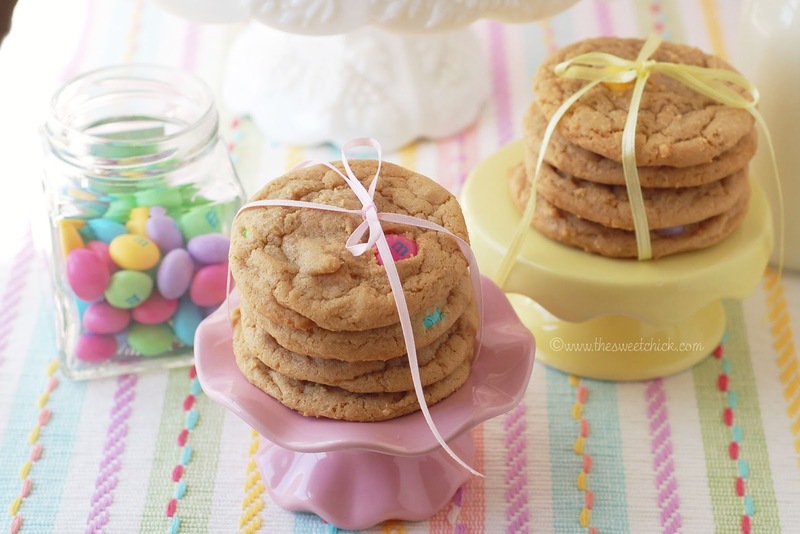 Well, if you are looking for something to make with your leftover Easter candy or leftover dulce de leche, you have come to the right place. Target sold white chocolate M&M's this year at Easter time. I don't remember seeing these before. I had to try them. They taste phenomenal. And I don't usually like white chocolate. I am more of a dark chocolate or milk chocolate kinda gal. Before I ate the whole bag by myself, I decided I had to make some treats with them. I really liked the taste of white chocolate and dulce de leche in my Dulce de Leche Rice Krispie Treats so I thought I give it a try with some cookies. I took inspiration for my cookies from How Sweet It Is Puffy Peanut Butter Cookies with Chocolate Chips. I am finding all sorts of new uses for dulce de leche. If it wasn't for my Argentinian in-laws, I wouldn't even know it existed. Now that would be a shame. I love the colors of these M&M's. So pretty! I could have just eaten the batter like this, but I was good and baked it. Although I did have to battle my daughter to lick the bowl afterwards. The cookies started out puffy, but then flattened out. I was a little disappointed, but the flavor combo was right on. 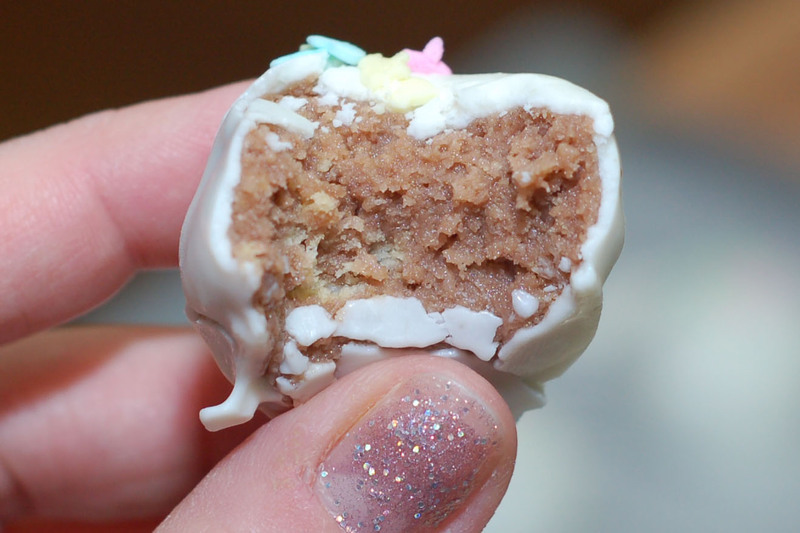 Just the right amount of dulce de leche and white chocolate M&M's. Heaven! The cookies came out soft on the outside and chewy on the inside. Preheat oven to 325 degrees F. Place butter in microwave safe bowl and heat in 30 second increments until melted. Let cool completely. Then mix the melted butter and the dulce de leche. Mix the flour and baking soda in a bowl and set aside. In another bowl, mix the cooled butter/dulce de leche mixture and sugars until they are combined. I used my stand up mixer. Add the egg, egg yolk, and vanilla and stir until mixed. Gradually add flour and mix until a dough forms. Fold in the M&M's. I did this part by hand because the white chocolate M&M's are so big. Shape the dough into a ball about 1 inch in diameter. I used a cookie scoop. 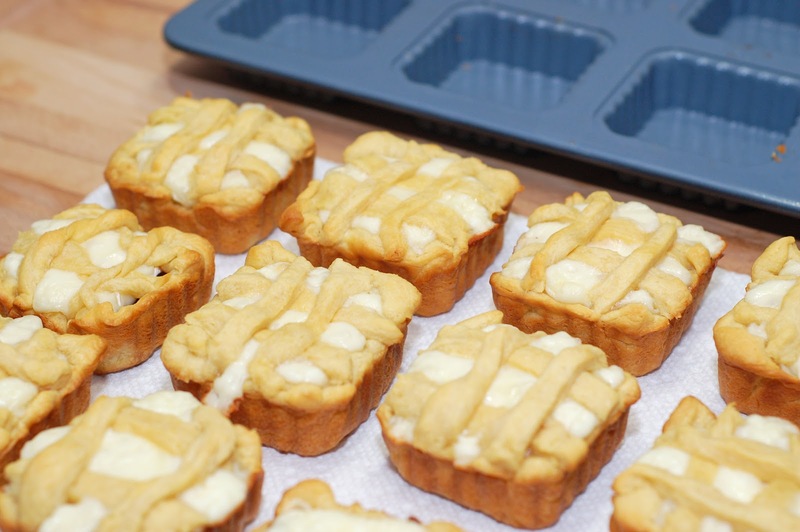 Place on a baking sheet two inches apart and bake for about 10-12 minutes or until the edges are slightly brown. 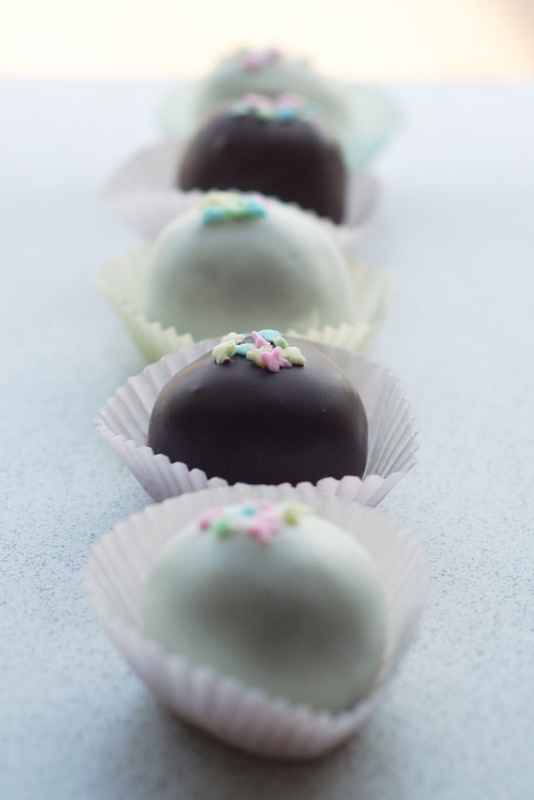 The centers should be soft and puffy. Do not over bake. Let cool for a few minutes, then transfer to a cooling rack. Make sure you get your glass of milk ready to dunk those beauties! I have been busy trying to fix a problem with my blog. I finally was able to get rid of the double posting. I never thought I would be editing HTML code. I have learned quite a lot of things since starting this blog. I almost know what I am doing now. Sort of. Anyway I have yet another scone recipe for ya. 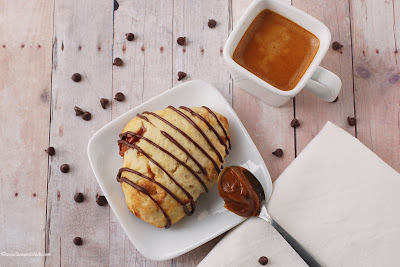 For any of you that have recently made some of my dulce de leche treats and have some leftover dulce de leche, (that would be those of you that don't have husbands that eat it by the spoonful straight from the container like mine does) here is another good use for it...stuff it in a scone! Yeah I said it...stuff it! If you don't feel like stuffing it, you can just mix it in, but I like to get messy. Mix flour, sugar, and baking powder. Cut up butter and add to flour mixture. 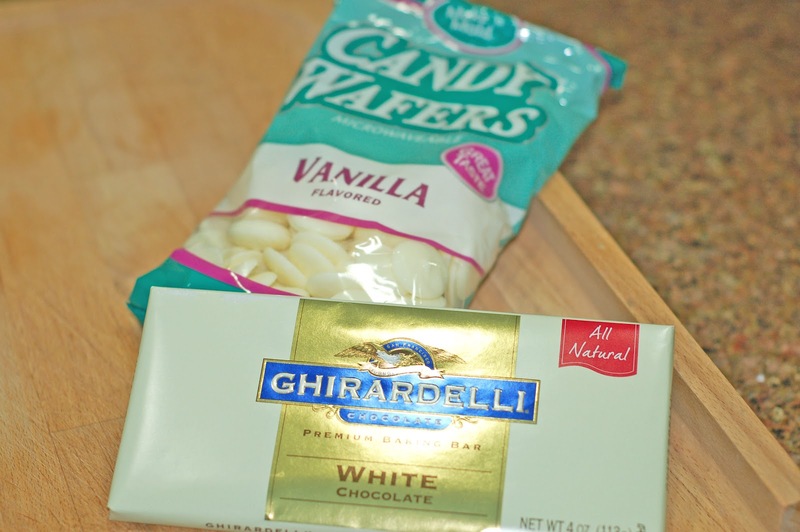 Add white chocolate chips. In a separate bowl mix egg and milk until blended and add to the flour mixture. The batter will be a dough like consistency. 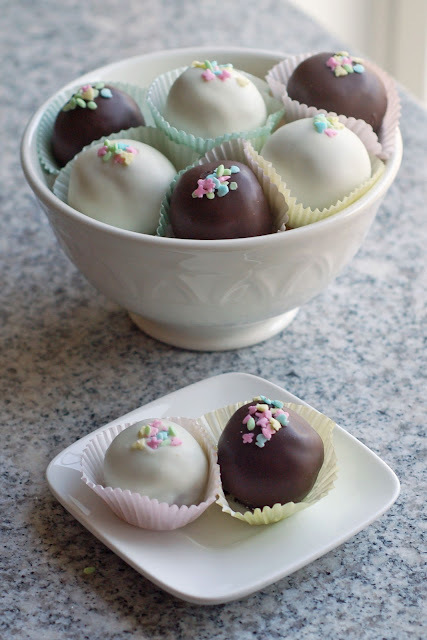 Separate dough into 12 balls. Then take each ball and split in half. Add 1 tsp dulce de leche in the middle and wrap the dough around the filling. Then form the balls into triangle and place on cookie sheet. No need to be perfect. When scones have cooled off, melt the chocolate according to package and drizzle over the tops. Let the chocolate set and then it's time to eat and enjoy!